Book Description: This book is a collection of over 30 miracle stories, written or told by ordinary people who have experienced extraordinary things. Each of them is recorded, with integrity and from the heart, to encourage others to believe in, and to trust the God who made the miracles possible. The book includes stories of life change, transformation, provision, protection, and supernatural healing. The heart of the author in collecting and publishing these stories from friends, acquaintances and strangers is to glorify God for his goodness towards His people and to make Him known to those who do not yet know Him. Doris Schuster, the author of God’s Not Dead! 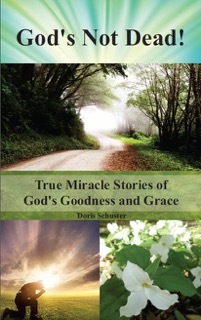 True Miracle Stories of God’s Goodness and Grace has been involved in editing and proofreading for over 30 years and is now putting her skills to work to help first-time authors polish and publish their books and memoirs. She is also passionate about healing prayer ministry, particularly ministry to hurting women. NO SHIPPING COSTS for Connexus Community Church members and other Barrie/Angus locals who wish to purchase this book. To order your copy, just e-mail me at Doris@ChristianEditingServices.org. Otherwise, please order at Amazon.com (Click here to go there now) or Amazon.ca (Click here to go there now). support our Abused and Abandoned Women with Children Ministry. The book is amazing!! I bought 2 copies praying for the extra to get into the right hands. My mother ended up taking it after nonchalantly reading one story when I was visiting, and she became a Christ follower after that. That’s a miracle in itself!! Thank you Doris for being obedient to His call!! I am so excited and happy for Doris! I am so glad you have finally written the book I’ve been hearing about! I can’t wait to read this book. Our Father is an amazing God and I’ve seen Him do miracles in my life and in the lives around me. Thank you for your endorsement, Burt! You’re right. I’ve been talking about this book for years and this was the year God nudged me to do it.